When I first started blogging, I armed myself with a notebook to write down my ideas and plans. I am no good without a list of some sort (all the women in the family blame it on genes). I mean, I'll even put something I did for the day on my list, just so I can cross it out. 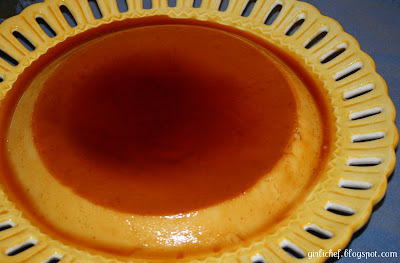 Well, one of the first things on my "to blog about" list was flan. My hubby loves flan and for many years asked me to make it for him (especially around birthdays). It was something I hadn't made previous to meeting him, although I'd eaten it...and loved it. All of the recipes I'd found were so involved and you had to take the time to make a custard. You had to make caramel and coat individual ramekins. You had to put them in a roasting pan and set them into a water bath. Well, back then I didn't have any ramekins. I didn't have a roasting pan. I didn't have the tools!!! I did eventually get my ramekins...and my roasting pan. What this really meant is that I now had NO excuse NOT to make flan. I looked to my favorite Mexican cooking guru (everyone together now...the genius...Mr. Rick Bayless). He had a few different methods, ending in different results and I kept thinking I just don't know. I procrastinated a bit longer. I procrastinated right up until the day I bought a newly released cookbook called Nigella Express, by the lovely Nigella Lawson. What, you say? Nigella is British!! What does she know about making flan? She knows she's a Brit, she acknowledges that her recipe is a simplified one...but she also says that a Mexican camera assistant she once worked with said that her flan was as good as his mother's (!). And yes, it was the opposite of intimidating. The recipe is almost too simple. So, I made her version (no ramekins required); just a pie plate and my antsy roasting pan (use me, use me). Mission: accomplished. This was the best flan I'd ever tasted. It was smooth, creamy and perfect. I have made it countless times since. It's one of the things I send along for workplace potlucks (people actually request it) and various celebrations. Nobody is the wiser that it isn't made from a recipe passed down through the generations (on hubby's side). I guess what I'm trying to say is that I can FINALLY cross flan off that list started some 3 months ago. 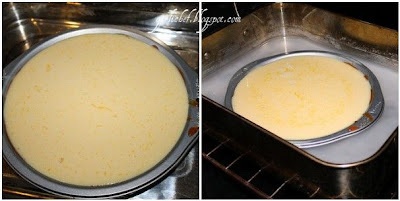 It was actually Spryte who gave me the motivation...she made a flan last week...and I knew it was time for me to share this ridiculously simple recipe. Just don't tell any of hubby's friends my secret...hey, I enjoy being praised. Preheat oven to 325 degrees F. Put on a kettle or pot of water to boil. Put the sugar into a 9" pie plate (**metal), and place over low heat until the sugar begins to turn into a liquid syrup. Swirl the sugar every now and then as it melts. The sugar will begin to caramelize-just before the sugar reaches the color of maple syrup, take the pan off the heat and place it on a cool surface. I use a regular spoon to stir it around because the pan gets so hot after a bit. 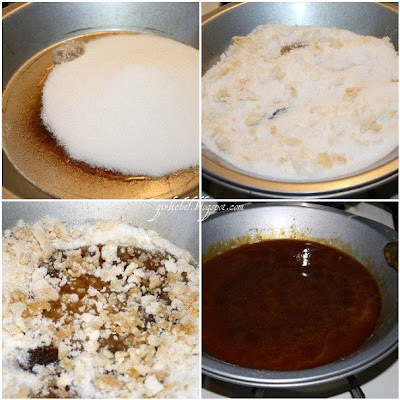 It helps to press down the sugar chunks towards the end of the caramelizing process. Yes, it will be covered in caramel when done...just run it under the hottest tap water until it melts off. Also, note the dark ring formed around the middle of my pie pan, this WILL happen to you, too...it's from the gas flame. 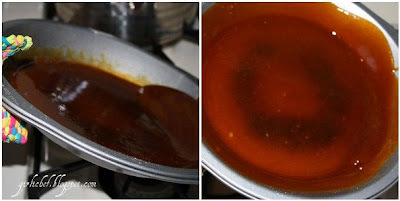 It doesn't affect the pans performance, but if you want yours to stay pretty for pies & what-not, set aside a separate one just for making flan- you will definitely want to make it again. While the pan is cooling down a little, swirl the caramelized sugar a little up the sides of the dish before it sets. 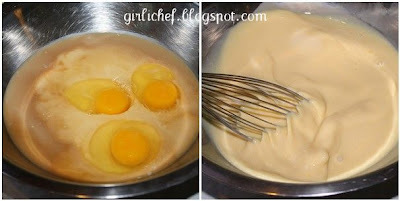 Empty the evaporated and condensed milks into a bowl and whisk in the eggs and vanilla. Yup, it's just that easy. Pour this mixture over the syrup-lined pan. Set your pie plate into the roasting pan first; it makes it much easier. Put it into a roasting pan, Fill the pan with boiling water, about 1" full. I try to set the roasting pan on the oven rack before I do this. 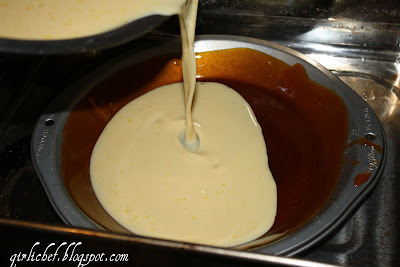 But, inevitably, while pushing the rack back into the oven, I slosh some of the flan mixture into the water. EVERY TIME! It has become kind of a ritual. I think of it as part of the process. Bake for 45-50 minutes or until firm and set. Even though you may be tempted to leave it in longer than 50 minutes...DON'T!!!! It should look a little wobbly. Honest. Lift the dish carefully out of its water bath and set aside to cool. I just let it sit on the counter until cool. Then wrap it well with plastic film. Leave the flan in the fridge overnight or for at least 4 hours. When ready to serve, turn the flan out onto a dish with a enough of a lip to stop the syrup running off. If the flan is going to travel, I leave it wrapped, in the pie plate, and send along a plate to turn it out onto. It's much easier to turn it out at your destination point. After setting a slice on the plate, use a spoon to get some extra caramel sauce to drizzle over the top. Be prepared for requests to make this again. The nice thing about this flan, other than it has worked perfectly every time, is that you can change it up a bit if you like. I have subbed almond extract for the vanilla. I have added expresso powder to the evaporated milk (stir & dissolve) before adding it...and Spryte, I bet you could even stir in some lemon zest and it would be awesome. I think I'm going to sprinkle in some cinnamon and mexican chocolate for fun next time! Amazing! For the sake of my curiosity I'm going to give this a try. I was a little nervous when your directions said to put the pie plate over heat until I realized you were using a metal pan. holy shizzle my nizzle I love me some flan and I would be all over this bad boy....well done! It's picture perfect!! And oh-so-delicious looking!!! It looks so good! I have never had flan before, clearly I am missing out. I have that Nigella cookbook but don't remember this recipe. Thanks for the reminder! The flan looks great. I'll have to get a suitable pie pan in order to make it as I only have a nice Emile Henri ceramic one right now. This surely sounds like a very simple dessert and if it is the same dessert we call creme caramel it is delicious. I never made creme caramel because they use more eggs but I will certainly try your version. Holy cow I made flan, too!! Is it me or have we been making some similar dishes this week. LOL. Yummy!!!! Yours turned out great! ok, I deserve to go to the corner and cry. I've never tried flan before! but I'm already dreaming...I wonder how PUMPKIN flan tastes like? Have you ever tried experimenting with this? Okay you know I am only looking at this while hubby is downstairs, or I would also have to do it for him! That is some deliciously looking, plated, and hubby approved flan girl! My hubby is portugese and this is a stable in his family. I am not a fan but I will make it for him. Yum. All I can say is, WOW, I'm blown away with your presentation. What a perfect plate for the flan. The whole thing looks like a perfect sun. How pretty. Gorgeous Flan! It looks absolutely picture perfect. I have attempted before but never made one so pretty. It looks perfect! My husband loves this kind of creamy, custard-y dessert but it's been a while since I've made it. I'll have to surprise him . . . ! I love flan! I order it even when I'm too full and manage to stuff it down. I've always wanted to make it, but somehow never actually gotten around to it. Seeing your post reminded me. I need to try this! What the heck Dar? That looks incredible. Reading your directions makes me think that I can make Flan! My honey loves Flan and I have never made it before. I think he might want to throw a big "THANKS" your way. This looks wonderful. I think the cinnamon and chocolate sound like great additions, but I bet it's perfect just as it is. Absolutely beautiful! I just want to take a big bite out of it, well done! ...tee hee ~Jen! F actually knows the recipe...it's the people he works with who rave over it and ask for it who don't, LOL! thanks...luv u 2! ...Coleen, I know..isn't it so happy & sunny :D Love it. That looks great and really is almost the same. I bet I over cooked mine!! Now that I seen this-I must make it,and the best part will be that I won't have to SHARE it (he he he-evil laugh)!! LOL - I love how you said you makes a list of things to do and then add things you did just to cross them off : ) I do the same thing : ) It makes me feel like I've got a head start. I've never made flan, but I have that Nigella cookbook. I'll have to try that one soon. 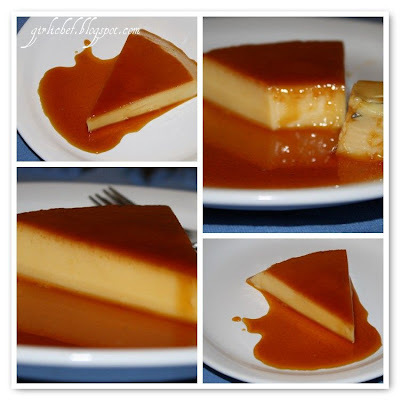 Delicious and gorgeous flan! I've never made one - can't wait to try! I've never made a flan. Yours looks wonderful and it's one of my husband's favorite desserts to order out. Girlichef, your flan is beautiful. I have a recipe for espresso-chocolate flan that I have been wanting to make. I procrastinate because the first time I made one it was a disaster. But seeing your beautiful creation has given me a new incentive. Thank you my friend. I bet it was delicious. My MIL *loves* flan. I think I could make yours. I'll have to try it for her birthday this summer. Looks plate-lickin' worthy! My mouth is watering! Mmm, I love flan. This looks so creamy. 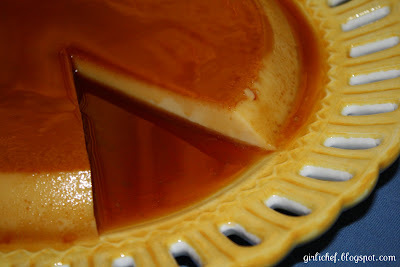 Note to self: must make flan soon!